We’re Painting the Map Purple! This mission to find a cure is so much bigger than one individual but in the end all it takes is one action by one person at one time to change everything. Deborah, middle, surrounded by her supportive loved ones. 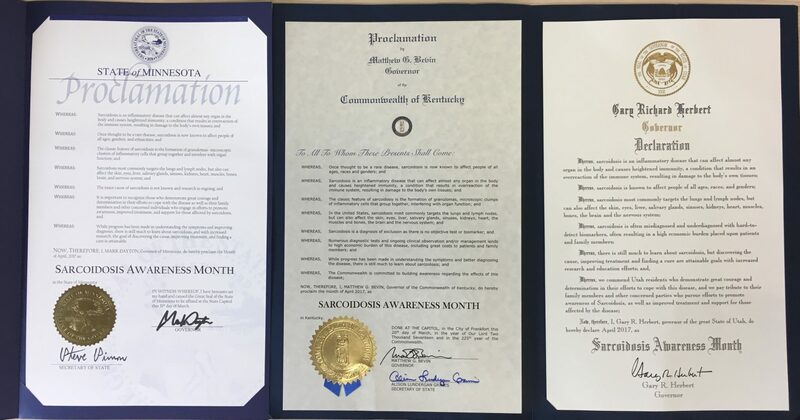 FSR’s Patient Ambassador Deborah Rice has gone above and beyond the call of duty this year in getting proclamations for Sarcoidosis Awareness Month. She has secured Awareness Month proclamations for at least 15 states as well as collaborated with and advised other individuals who were working to get proclamations. After being diagnosed with Sarcoidosis I would tell family and friends that there was and is a purpose behind this. Up until 2 years ago the purpose was unclear. Today as the visions begin to prosper; every conversation, every photo, every proclamation is to bring forth awareness. Why I am so committed, to put it plainly, I have a job to do. 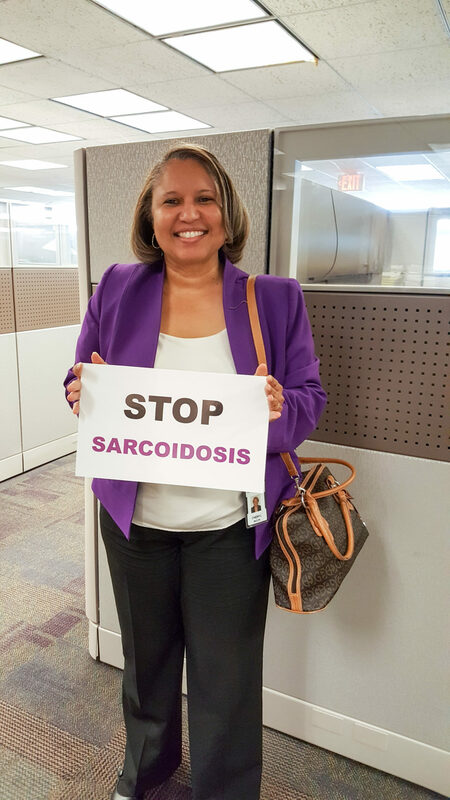 Unfortunately, just because proclamations and resolutions are being passed doesn’t mean that anyone is talking about Sarcoidosis, so as an attempt to get conversations going about the disease I started a photo campaign. The response of the community with this project blew me away. I can’t wait to share the pictures. To date, Deborah single-handedly secured proclamations from these states: Arkansas, Delaware, Idaho, Maryland, Nebraska, New Mexico, Oregon, Tennessee, Texas, State of Washington, Utah, Kentucky, Iowa, and Minnesota. She also collaborated on a proclamation that was passed in Wisconsin, and is waiting for Wyoming and District of Columbia to be signed. I started advocating for Sarcoidosis patients because of my frustrations. The lack of knowledge about the disease and the unwillingness of the doctors to think outside of the box. I am my own advocate so let my voice be heard. Together lets educate and find a solution. 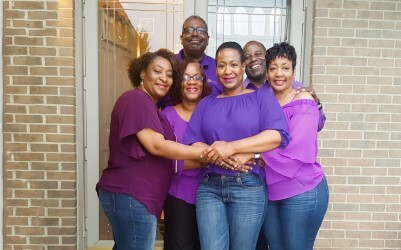 As part of her photo campaign, Deborah has been asking people to wear purple and hold signs about sarcoidosis awareness. Not only does this educate those who are in the photos, but sharing these photos grabs the attention of others. Last week, she saw a stranger in a purple jacket and took a chance, asking to take a picture of her to share with us for the campaign. The woman was smiling the whole time and Deborah got the chance to share her story and some information about sarcoidosis with her. Deborah truly exemplifies a sarc warrior who isn’t afraid to advocate for herself and others, and to ensure that her voice is heard. FSR is proud to have Deborah as one of our patient ambassadors. knows about sarcoidosis and can help raise awareness. Deborah lives in Birmingham, Alabama. She was diagnosed with pulmonary sarcoidosis in 2000. She is a proud mother of two, and grandmother of two sweet girls. This is her second year as an FSR ambassador. Thanks to the work of ambassadors and volunteers like Deborah, we’re so close to painting the map purple! See our map of which states have passed a proclamation this year and which are still pending! FSR is so grateful to these volunteers- we couldn’t do it without your help! Did your state already pass a proclamation? Raise awareness in your community! You can work to get a local proclamation from your city- see our proclamation toolkit and get started now. Help us #PaintTheMapPurple! Join the photo campaign by sending us photos of you or anyone you know (or, like Deborah, anyone you pass on the street in purple) with signs to raise awareness. Send photos to maggie@stopsarcoidosis.org with your story!